WOULD YOU LOSE YOUR WATER SUPPLY? All are possibilities in today's fragile world and all could reduce or eliminate power for weeks, months or even years--throwing us back into the 1800's and jeopardizing your ability to cope and survive. Without power, most Americans would not survive long. 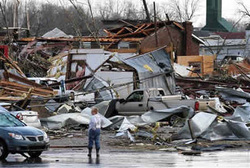 As bad as the loss of power would be, the loss of water to live would be the most devastating. Without water, no man, woman or child can live longer than 3 days. Why Any Backup At All? FOR RIGHT NOW -- to protect your family against grid failures, hurricanes, tornadoes, floods, forest fires, ice, snow and wind storms. FOR POSSIBLE FUTURE PROBLEMS -- political unrest, emps, worsening climate, cyber attack and more. on the market, and yet it's available at a price no other "serious" pump can match. PRIMARY PUMP. SOLAR AND/OR ELECTRICAL OPTIONS ALSO AVAILABLE. 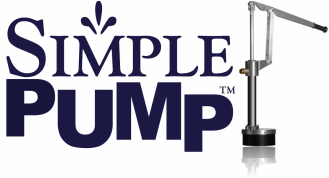 Simple Pump pumps into pressure -- the pressurized water tank of your home's plumbing system -- and gives you full use of ALL your household plumbing -- year round -- IN ANY CLIMATE. Some of our clients have replaced working pumps of other kinds because the Simple Pump is SO much easier to use. Remember slamming older car doors compared to the gentle pull needed for a modern door. That's the difference that computer controlled machining and modern materials make. as 350 feet water level. Fits in many wells where no other hand pump can be installed. Needs only 1-3/4" clearance.